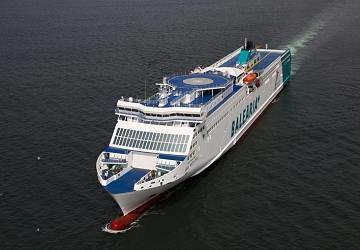 Part of the innovative Balearia+ series, Abel Matutes is Balearia's largest ship. 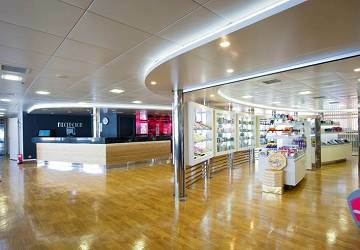 Onboard you'll find modern seats, baby changing area, bar-café, cabins, cots, highchairs, left luggage locker, disabled access, reclining seats, self service restaurant, solarium, Wi-Fi, audio visual entertainment, shop. 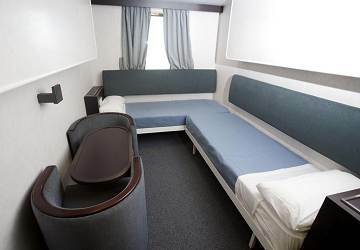 The Abel Matutes ferry has around 90 4 berth cabins, with air conditioning, wardrobes and fully fitted bathroom. All the cabins feature an anti-allergy cleaning system. 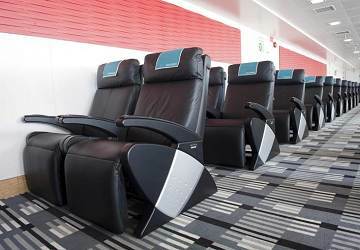 Reserved seating comes in the form of extra comfortable leather recliners in the Neptune lounge while the lobby bar lounge consists of chairs and sofas in a communal area. 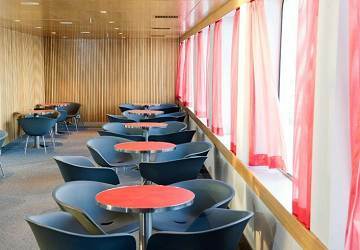 You'll find a bar/cafeteria and self-service restaurant located in the bow. There is also an outside bar. 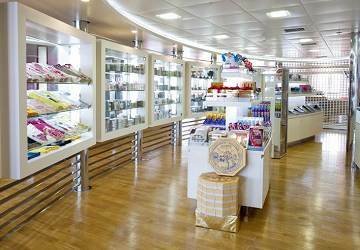 The Abel Matutes features an onboard shop where you can buy a range of cosmetics, perfumes, sweets and gifts. 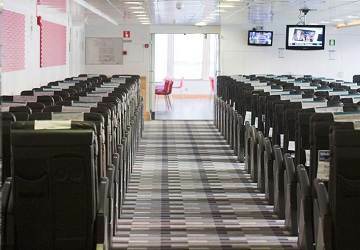 There is a solarium for you to relax in during the trip and if you want to surf while you sail then you can use the onboard Wi-Fi (for a small fee). 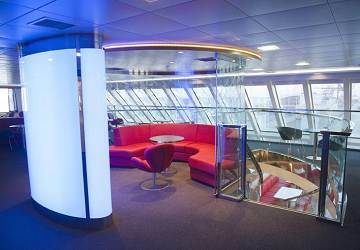 For those travelling on foot there are luggage lockers which you can access throughout the crossing. Escalators and lifts link the car deck with the passenger area too. Please Note: Whilst we have taken great care in making our Abel Matutes guide as accurate as possible, onboard facilities, services and entertainment may vary depending on the date and time of year that you travel, facilities mentioned may change without notification and ferry companies reserve the right to operate vessels other than those mentioned at time of booking without prior notification. I recommend upgrading to a cabin if you take the overnight - having your own shower, toilet, and bed is well worth the extra $. We were lucky that our 7.5 hour ferry ride during the afternoon was not crowded so we were able to find a "couch" in the cafeteria to claim and nap/relax. However, the seats in the first upgrade option are nice & big, recline back, and look super comfy. The staff was helpful but the food is mediocre so I suggest bringing your own food/snacks. I'd recommend using this company! Good crossing, departed and arrived on time and our cabin was clean and very comfortable. 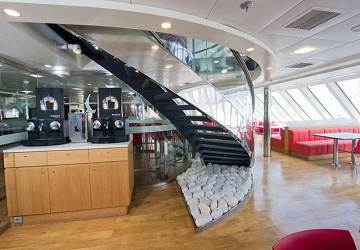 Great boat even better facilities and good food!! "professional transfer to the islands"
It's been almost 2 years now that I use your ship from Barcellona to Majorca and I am satisfied, the restaurant could be improve in quality. Having travelled on both companies, the Neptune class is the most comfortable way to go. The food however is a bit limited unless you want to go for the full traditional Spanish meal. 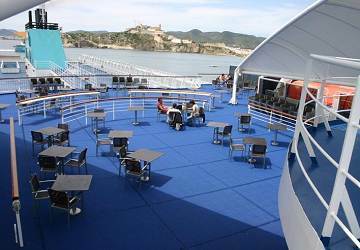 Many people take a picnic on board which is probably the best option. The bus to / from the terminal is painless. Sunshine, smooth seas, minimal passengers, friendly and helpful staff. Bathrooms clean, hygienic and well supplied. An excellent voyage. Be at the terminal min 90 mins before departure".. It was a quiet and safe travel. Food services could be better. Good value for the price. "Overall a reasonable alternative to flying "
Travelled Barcelona to Palma as foot passengers overnight, with a booked cabin for 4. After checking in at the Estacio Maritima we were directed to queue for a bus as the ship was berthed about 5 km away. No explanation for this was offered. The ship was OK but parts of it were crowded with cabin-less youth groups but the cabin we had was clean and comfortable and larger than expected. We didn't use the catering except for a quick drink at the bar (OK) and coffee in the morning (pretty awful). Apart from the bussing -which we could have done without- the boat was efficient and on time. Overall, a good alternative to flying but the service overall was not as good as ferries we have used on the North Sea and English Channel (DFDS and Brittany Ferries). 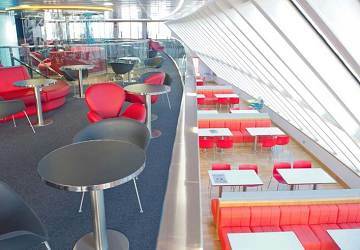 Would not hesitate to book via direct ferries again. Never had any problems on this or previous trips. Book baleria and be aware that the terminal in Barcelona is "over the bridge" near end of pier and just looks like a random yard. It is better signed now but still not obvious/allow a bit of time. as you are not issued a ticket do not be phased when you have to queue at a portacabin to be issued with your actual ticket. Bit of a wait but looks more of a fuss than is. Don't book a cabin but book a first class seat as is huge and comfortable. Eat paella and booze with the lorry drivers and have fun.